Custom Displays and Furniture for personalized Interiors. Enjoy a well thought out space in function and design. Individual concepts and custom interiors based on your needs. Every space is different, every office has its own requirements and every client has a vision. 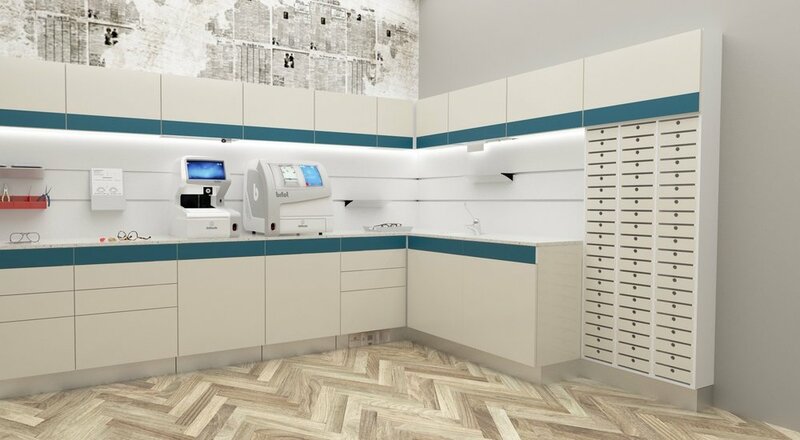 "We bring your vision to life"
Specialized in Optometry Offices and Optical Stores we have extensive experience in designing a functional and efficient environment. Custom Displays and cabinetry allow for a maximum and optimized use of your space. Making your patients visit a new and memorable experience, makes your business a success. Our Exam Room possibilities are unlimited. Customize your Examination Lane for an optimized work flow, a clean and organized look. Hidden aspects as well as the attention to detail are emphasizing a medical environment and highest comfort for you and your patient. A well organized exposed Lab offers insight from the Optical into the Lab. Cabinetry with built-in amenities will organize your Lab, keep it clean and enable an efficient work flow. Bring your work closer: show the craftsmanship, your High Tech equipment and highlight all aspects of a frame for a better understanding and appreciation. The swivel computer table addition for a patient friendly approach. The swivel table enables to face the patient while typing but can be placed above the counter top during the exam for more space. Visit us at this year’s Vision Expo East in NYC. Send us your floorplan in advance to get a free deisgn proposal! Discover the entire optometry office here. Cabinetry with built-in amenities will organize your Lab, keep it clean and enable an efficient work flow.